Can You Cook a Shank Ham in Boiling Water? Boiled dinner traditionally uses corned beef, but ham is also good. 2 Does Boiled Ham Have Nitrites? The canonical New England boiled dinner, the version you'll find in most recipes, is made with a piece of corned beef. 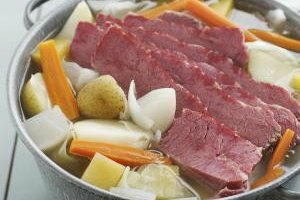 In practice, a satisfactory boiled dinner can be made with any piece of salted beef or pork. Hams are often chosen, because they're flavorful and require less cooking time than a comparable piece of corned beef. Boiled dinner has its origin in the days before refrigeration, when a winter's supply of meat could only be ensured by salting. Unlike modern hams and bacon, which can generally be used as is, old-fashioned salt meats were heavily brined and required soaking in fresh water in order to be palatable. Even after soaking the meat was often still salty, so it was commonly boiled to remove the excess salt and cook the meat. The water that was used for cooking a ham or a piece of corned beef became infused with its flavors during the cooking process. That made the water itself a valuable ingredient, because it could in turn impart flavor to vegetables or soup. The traditional boiled dinner, with a large quantity of vegetables cooked in the same pot, allowed a frugal housewife to give her family a lot of meat flavor with a relatively small amount of meat. It also conserved fuel and saved cleaning additional pots. The modern hams that most closely resemble the old-fashioned variety are the dry-cured, heavily salted "country hams" still made and loved in the South. They require long soaking before they're cooked, but give the boiled dinner an excellent flavor. Aside from a country ham, bone-in hams or the smaller smoked picnic shoulders make excellent boiled dinner. The bone in the ham adds flavor and body to the cooking water. A good-quality boneless ham will also give a good end result, and is easier to slice for serving. Avoid the processed, football-shaped boneless hams, which can give the water a chemical taste. A canny cook always makes extra vegetables when preparing a boiled dinner, because the flavorful leftover vegetables are useful in preparing additional meals. Meat is no longer scarce, but leftover boiled dinner still makes an excellent hash for breakfast or brunch the next day. The vegetables can also be mixed with eggs for a tasty frittatta or quiche, or used to make a casserole with cream soup and a topping of breadcrumbs. Give these leftovers a new flavor by adding a ranch-flavored dry mix. The cooking water, with the flavors and nutrients of the meat and vegetables, can be used to make a rich pea or bean soup.